Thelton Cread “ Bud” Burger, 83 of Duncan, Oklahoma passed away Monday, February 4, 2019. Funeral services will be at 10am Friday, Feb. 8, 2019, at First United Methodist Church in Duncan, OK, with the Rev. Dr. Janice Sharp officiating, assisted by the Rev. Kathy Gibson. Interment will follow at Duncan Cemetery. 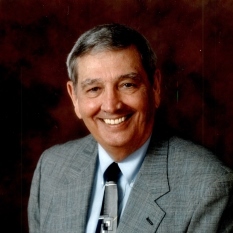 Services are under the direction of Don Grantham Funeral Home. The family will visit with friends at the funeral home Thursday Feb. 7 from 5-7pm. Bud was born May 31, 1935, in Waurika Oklahoma to Doris (Wright) and William Cread Burger. He graduated from Waurika High School in 1953 and was a proud member of the 1951 state champion football team. He attended the University of Oklahoma and played semi-pro baseball before moving to Duncan to work for Halliburton Services. Not too many years later, he went in with his good friend Clyde Edwards to open Edwards Home Furnishings. In 1974, he married Martha Lindley in Duncan where they made their home. Bud was a great salesman. Over his life he sold insurance, cars, siding, and medical equipment until his retirement in 2000. For 20 years Bud broadcast Duncan Demon football on the radio and in 2017 he was inducted into the Duncan Sports Hall of Fame. Bud enjoyed life. He had a gift for building people up and was good at lightening up the mood with a joke or story to fit any situation. He was kind to everyone and always looked on the bright side. He loved his family and friends and always let them know it. Bud believed in the power of prayer and always said that anyone looking at the grandeur of the mountains in Alaska or the vastness to the order of the universe had to know that this was no accident, but was the work of the Creator. Bud loved being son to Doris and Cread, brother to May Nell, Dad to Jennifer and Jaynelle, husband to Martha (who he loved unconditionally for 44 plus years), and friend to too many to name. Survivors include his wife Martha Burger, of the home; daughters Jennifer Burger Snodgrass of Alexandria VA, and Jaynelle Burger Schamber and husband Gary of Stevenson Ranch, CA; his sister May Nell Walker of Waurika OK; grandchildren Steven Snodgrass and wife Courtney, Carlye Snodgrass, and Christopher Schamber; two great-grandchildren, Dylan and Raelyn Snodgrass. Bud is also survived by nieces Pat Robinson and Jill Bates, and a nephew John Cread Walling. He was preceded in death by his parents, Doris and Cread Burger; and a brother-in-law Kenneth Walker. Pallbearers will be: Leonard Case, David Dowell, George Lindley, Hal Pennington, Christopher Schamber and Steven Snodgrass. Honorary Bearers are: Bill Cobb, Jerry T. Davis, Ken Graham, Don Howland, Dr. Jimmy Jones, Phil Leonard, Joe Litsch, Bill Randolf and Dr. Bob Schick. In lieu of flowers a donation may be made to the American Cancer Society High Plains Division Oklahoma City; the Stephens County Humane Society; Duncan Regional Hospital Health Foundation or The Simmons Center Foundation.